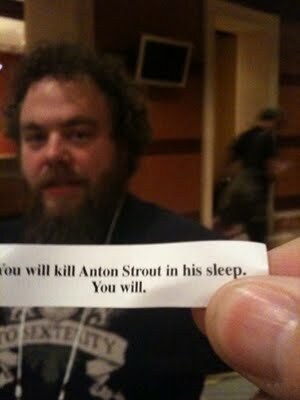 Those of you who have been following my blog for a while know about my ongoing antagonistic relationship with Anton Strout. He is the Moriarty to my Holmes. Though that might be overstating things a bit. Maybe he’s more like the Magneto to my…. No. I don’t want him being Magneto, either. He can be…. Emma Frost. He’s the Emma Frost to my Jean-Luc Picard. Wait. Nevermind any of that. This analogy just isn’t working out. Suffice to say that Anton and I have had a long-standing rivalry that I keep interesting by occasionally trying to have him killed. Now, years into our comfortable relationship, Anton has thrown me a serious curveball. You see, despite our ongoing relationship, Anton has always been cool about helping out with Worldbuilders, the charity I run every year to raise money for Heifer International. Over the years, Anton has helped spread the word about Worldbuilders, donated signed books to the cause, and even auctioned off a read-and-critique in support of the charity. But now he’s taken things to a whole new level. Now when someone has a new book coming out, there’s a bunch of stuff they can do to promote it. They can get bookmarks printed to give away at conventions. They can buy ad space in a magazine. They can do prizes or giveaways on their blog. But a couple months ago, Anton approached me with a different sort of an idea. Anton: So I’ve got a book coming out at the end of September…. Me: Curse you, Strout. Curse you and your vile ability to meet your deadlines…. Anton: It’s a new series. The Spellmason Chronicles. Me: Yes. My spies have reported it to me. 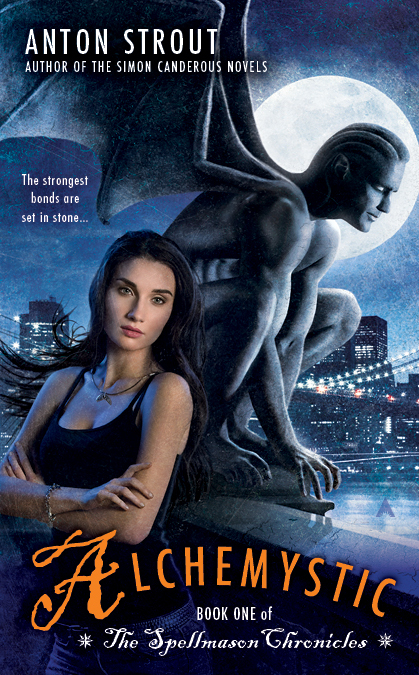 One of the main characters is a gargoyle, isn’t it? Anton: I was thinking that for every copy of the book that gets pre-ordered. I’d donate a dollar to Worldbuilders. Anton: I talked to the PR people at Penguin, and they’ve said that for the first 1500 books, they’ll kick in a dollar, too. Anton: So… for the first 1500 books, we’ll donate 2 bucks for every pre-order. Anton: Are you still there? Anton: Yeah. I was thinking about a bunch of different things I could do to promote the book, but this seemed like a better way to spend the money. This way, I get the word out about Alchemystic, but the money can do some good in people’s lives, too. Anton: And it will act as kind of a nice prologue to this year’s fundraiser too, remind people that Worldbuilders is coming up in a couple of months. It’s not often that I’m caught without something to say. But it does happen. In all seriousness, folks. This is an unprecedentedly generous thing that Anton is offering to do. It says a lot about Penguin too, that they’re willing to back his play like this and offer matching money. Not only does Worldbuilders stand to make some money here, but if this goes well, I hope other authors might consider doing something similar to promote their books in the future. In my opinion, it would be really great if Anton sold a bunch of books. Like, a crazy amount of books. So many books that other publishers were startled by the number. So many books that folks took notice of this as a viable advertizing solution. In my opinion, a donation to Worldbuilders beats the hell out of spending money on refrigerator magnets or ad space. And honestly, I’m ashamed that Anton figured that out before I did. So. Today I called the local bookstore and ordered my copy of Alchemistic. That’s one copy. Pat, does digital edition (kindle) count? Yes, all digital formats will be counted toward this… thanks to my day job, I have access to all that info. What about pre-orders in Germany? Would like to know that, too. Don’t like ordering in the US and have it shipped, but I’d probably give it a go, if preorders in Germany count as well (even though I have no idea who this Strout guy is – he seems to be a reasonable nemesis to pick ;)). Done and done. In the meantime, could you possibly let us know if you actually received that fortune cookie message from Pat? Hi Anton, met you at Comic-con this year after the Fae panel(I was the one who asked you for more Simon books…), and i was already going to buy the book when it came out, but do i just pre-order from ANY book site to make sure this happens? I would love to help(and i did read the sampler they gave out, it was excellent and please let Penguin know they are great for doing this!). Thanks for signing my copies of Westward Weird and The Modern Fae’s Guide to Surviving Humanity. I DID enjoy them! Pat? Seanann McGuire was sitting next to him during the panel and at the signing afterward…she said she could take Anton out. Seriously. :) Just saying…but leave some of him left so he can keep writing? Please? You have yourself another preorder (Amazon paper format). I look forward to reading. Thank you! You can add another $2 to Worldbuilders. :D Fantastic idea. Mine’s in. Looking forward to WorldBuilders kicking off again! An awesome idea, pre-ordered my copy the moment I read this. Kindle format, and chances are I’ll pre-order a physical copy as well. I own most of my books in both. You gained +$2 in donation capability. 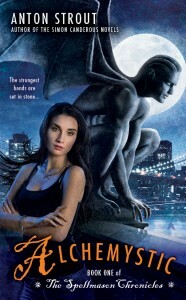 And a new series coming out by another talented author! Hurray! It may tide me over until I can get my hot little hands on the Doors of Stone! Nope. Although that blog is ten shades of awesome. Bah, you’re not lowly anything. I’m just a dude who makes up lies and types them out on his crappy laptop while sitting on the couch watching “Kitchen Nightmares”. …Don’t tell anyone, though. It’ll ruin my mystique! Mr. Strout, I look forward to meeting your words! Brilliant! Even your arch-foes rise above mediocrity and apathy with alacrity and enviable class. Perhaps Mr. Strout is merely the Bert to your Ernie – decency overriding the rivalry. My Kindle craves the new arrival. Cheers to you and yours, sir. This made me giggle – thank you! Another order here. The best of luck to you Mr. Strout. As a fellow fantasy author and one of the founding members of the League of Reluctant Adults, you would think that Anton Strout would be my friend. In fact, it would be reasonable for you to assume that he has my respect and admiration. However, nothing could be further from the truth. Strout is, among other things, my mortal enemy. The sordid details of our long-standing feud are multifarious, and I cannot in good conscience list them in a blog that children might read. Suffice to say that I have many worthwhile reasons to scorn the man, none of which have to do with the fact that he seems to have more luck with the ladies than I do. Nevertheless, I am a gentleman, so I’ll mention his book here. Just to show that I am the better person. I have not read his first book myself, for obvious reasons, but I’ve heard others say good things. They say that it’s urban fantasy with a strong comic twist. Charline Harris gave him a glowing blurb, so if you like her stuff, you might like his too. Speaking of Worldbuilders, i donated last year and apparenly i didn’t win. I say apparently, because i did not hear a single word about any actual winners, not on your blog, nor anywhere else. No emails from Heifer or anyone else that a drawing had actually been done. It’s not so much that i didn’t win (well ok a little), but the fact that i still have no idea if anyone else did win. It doesn’t really make me very pumped to donate this year. I think this could be improved upon, to make people come back and donate again next year. That’s a fair question. Pat? Can we at least have a post about the Golden ticket? I won last year, but not the year before that. I got a Bradbury book!!! Wow! So yeah, it happens. There are a Lot of folks who donate, so the lottery is well named. I’m planning on donating again this year. I saw many people state that they got their prizes, and Pat put up multiple pictures of them mailing stuff out. If you didn’t get anything, you didn’t win. He’s pretty clear about that. Heifer didn’t do the drawing, Pat and his “people” do it yearly. They don’t have the time or resources to contact every single person who participates to tell them that they didn’t win, so the general rule is, if you don’t get a phone call/e-mail/package in the mail, you didn’t win anything. No worries, I only know because I stalk this blog obsessively. Ack! And i thought i had sifted through all the blog posts before i wrote this. Clearly i should have been more observant. My apologizes to Pat and everyone else, my bad. I won a book from Worldbuilders–signed copy of Luka and the Fire of Life by Salman Rushdie. I was thrilled to win! Worldbuilders is such a fantastic idea and I have enjoyed donating for the past few years. I did a pre-order on Amazon.co.uk – hope that it counts. That is such a decent thing to do. Whoever Anton Strout is…you may be rivals, he may be your Moriarty/Macavity whatever, but I have to confess, I’ve never heard of him before today…. pre-ordered. Also, post shared on facebook. What a great way to kick off Worldbuilders. Oh, look, it’s also reasonably priced! Pre-ordered the ebook, looking forward to reading it. I sense a secret plot here of Pat eventually ruling all of the authors. Ordered. In fact, I’m just going to set up a script that automatically buys any book Pat mentions from now on. Libriomancer was awesome btw. Cool, new book by Anton Strout and new Mumford and Sons on Sep 25. It’ll be a good day. Guess I need to preorder. Okay, so I’ve preordered a kindle edition. Debating getting a hardcopy as well since it’d be fun to get one signed… and then have Pat sign it too. So the big questions are, have you reached 1500 yet and can you get Penguin to raise their matching past the 1500 cap? Can it be that Pat will become the Oprah of the Sci-fi/Fantasy book universe? Done and Done! Now to spread the word! If only I had such rivals to curse. In for a kindle Edition and posted on FB, Great Idea! If pre-orders from Amazon count then I’m in!! This is a really awesome deal; a new book and the knowledge that ordering it is doing some good for others. You’ve got one more pre-order. I think this is a great idea. I bought a copy. Books and charity in one swipe, you’ve got to like that. And now I am left to ponder… How do I get an arch enemy? Note to self, practice evil laugh. Good for you. Most folks forget the laugh, and that’s about standards. I, myself, have been working with a vocal coach. Do international orders count? I live in Canada and I can get it through Chapters-Indigo online. Pre-ordered the book for my Kindle. For $7.99 you can’t go wrong. Ordered from the Book Depository in the UK, delivery to Ireland; hope that this counts! Hmmm. Available as paperback from amazon.co.uk, but not as kindle. Presumably some kind of foreign rights shenanigans? Happily purchased as paper in the name of a good cause – thanks Catie for the Book Depository link (which was cheaper than amazon uk…). Ordered it form amazom.de hope it counts! Also, I would like a quasi-arch enemy. Preferably, we are only enemies on weekends–that type of thing. I feel like have a full-time arch-enemy would be rather draining. Dude! My Ranger/Assasin is FULL elven, and he’s level 41!!! Just ordered my Kindle version. Thanks, Pat and Anton (secret brothers after all). Heifer International is a wonderful charity. I make a donation to them every December; it’s fun to imagine a family receiving a flock of chickens, or rabbits. And they have some great stories on their website… very inspiring reading! If I ever start making grown-up money, I will buy llamas for everybody! In the meantime, however, lacking a llama, I have pre-ordered Anton’s book. Just for this, cause you made me giggle, you’ll be getting another pre-order. I love the smell of llama spit in the morning. It smells like… llama spit. P.S. Patrick never spit at me when I bought his books. Just to add fuel to the fire. Hey Anton, I just preordered the Kindle version. I haven’t ready any of your books before, if I wanted to read just one before this one, what would you suggest? b) My previous series is the Simon Canderous novels or as they’re often referred to “Diet Dresden.” I’d suggest the first book of that, Dead To Me, if you are curious about my shenanigans. I’m usually a reader, not a writer here, but this offers one question for me – “Diet Dresden” as in Dresden Files? Eff humanity! I mean, umm, thanks! I’d actually like to hear more about your attempts on Strout’s life. I tried to purge the earth of his presence for years, but failed. Furthermore, I’m curious to know the time, place, and circumstances of his transformation from plain old Tony to the much more grandiose Anton. I preordered it. I figure even if I hate the book (which is unlikely since I love all books, but I may say I do out of loyalty), then at least I have done a good deed. Ordered! Wish there were a running count; I’d love to see how the legions have responded! Ordered. Thank you, Mr. Strout! I have donated every year since Pat started the fundraising (when it was the Fundraiser Later Known As WorldBuilders), and was lucky enough to win once. This method is a 100% guarantee of winning! :o) Good luck with the sales! I like that school of thinking! And thanks! LOVE LOVE LOVE your books so really want to pre-order this book, but I cannot see a UK kindle edition – any ideas? cheers! Looks like i get to try out an author i haven’t read before AND help Worldbuilders! This is guy is Moriarty! I have two high-functioning autistic boys who spend their summers raising money for Heifer. It started when my oldest was 8 – he wanted to do something to make the world a better place (humanity depresses and terrifies him), so he started selling dog biscuits at our local farmer’s market and giving all his profits to Heifer. Now, 6 years later, he and his little brother and I are still working the market for Heifer, though now we make charms and jewelry (I never want to bake another dog biscuit as long as I live). We have donated several thousand dollars and raised awareness about Heifer. Equally importantly, my boys have built their social awareness and sense of personal power through this quest and educated their community about autism. Pat, I met you at your recent event at the University Book Store in Seattle (my friend hugged you, I hugged Nathan). My family and I are so excited that you and Anton are supporting Heifer. Now I’ve got my husband hooked on your books! I was reading the interview my girlfriend entered the room, cross read a few lines of the transcript and said “maybe I will read that, the title sounds cool”. Well, comes out 3 days before her birthday, so my preorder just went out to amazone. Jee, send me her name and a mailing address and I’ll sign a bookplate with a happy birthday message for her! I’m at anton.strout@gmail.com. Sadly it took me a few weeks to notice it. I have mailed you anyway. Okay, I never preorder books but I”m doing this…can’t resist the awesome. When my book comes out, I’ll do the same thing.